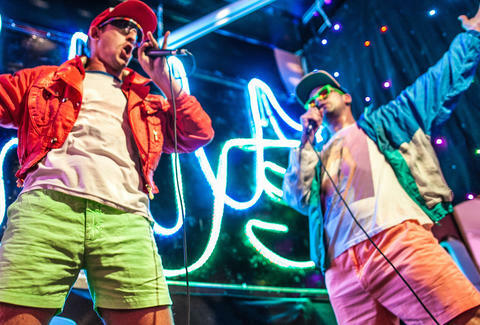 This Saturday, Chubbies is throwing an absolutely epic party devoted to the '80s, and we're so sure you need to get in on it, that we got you $15 off the VIP and "General Admission + Open Bar" tickets. But first, some awesome, Stefon-y details: there will be dancing robots, mullets on-the-go, DJs, games, prizes for the first 100 people to arrive, and no pants allowed. No, seriously, bring shorts, because there is literally a pant check at the door. Plus, there's a charity raffle that'll have prizes like a day on the Bay for you and six friends on the founder's boat, a $250 Uber gift card, and a Griz Coat. So, in order to get that sweet $15 off the VIP (which includes a pair of Chubbies!) or GA + Open Bar, simply enter the code ThrillistSF when you get your tickets here. Now throw on your '80s-est gear, and you'll look as cool as ice, man.